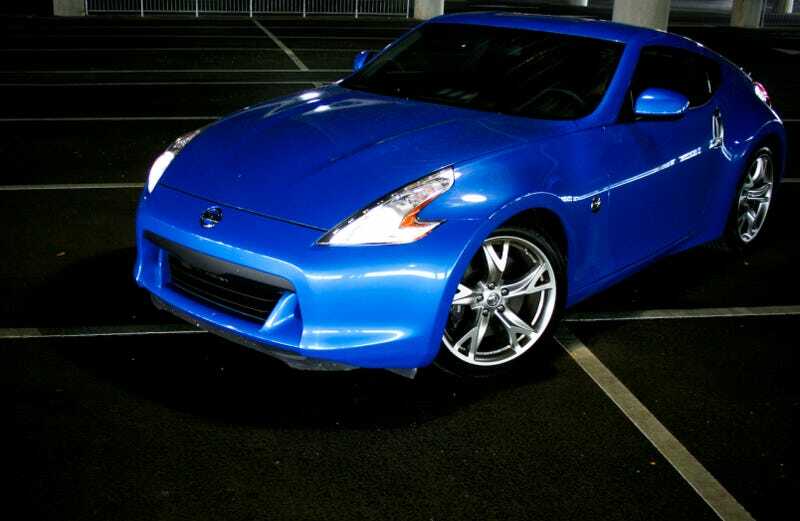 The 2009 Nissan 370Z is a seriously high tech car. But unlike other high tech sports cars from Nissan, this one uses that technology to increase driver involvement making it seriously fun to drive. We typically bemoan any attempts to "assist" drivers with any form of computer chip. ABS? That's for girls. Stability control? The car might as well drive for you. Torque vectoring differentials and AWD? Run for the hills, the machines have risen. So when we first found out about SyncroRev Match — a system that automatically matches revs on downshifts so you don't have to heel and toe — our response was predictably of the Luddite variety, saying it, "represents a further erosion of voluntary control and thus the skills necessary to go fast being removed from the driving experience." The thing is, now that we've driven the Z, SyncroRev Match has totally won us over. While we enjoy heel and toeing when we're driving fast, we don't bother while sitting in traffic and most of the rest of the driving public won't either when they're trying to text/shave/eat/pee while driving. SyncroRev Match does and also unlike us, it matches revs perfectly 100% of the time. That means smoother driving all the time, but it's a particular benefit while driving fast. Since the perfect rev match is guaranteed, it leaves the driver free to focus on things like staying on the road or delaying turn in to the last possible moment. Of course, you can switch it off if you still want to show off. Other technological advances on the Z tend less toward the gadgety side of things and more towards engineering. The 370 wears 200lbs more safety gear than the 350 it replaces, yet overall, it weighs only 33lbs more. Thank the extensive use of aluminum in the doors, hatch, hood and A-pillars for that. The engine now displaces more volume - as the name suggests its grown from 3.5 to 3.7 liters - and makes 26 more HP, now 332. More importantly, it sits 15mm lower, helping to drop the center of gravity closer to the ground for better handling. It also helps reduce the height of the hood, which is now so low that forward vision is on par with mid-engined vehicles. That new engine now sends its power to the rear wheels through a carbon fiber drive shaft that reduces inertial momentum, which increases responsiveness. Carbon can also be found on the radiator housing. That engine now uses a variable valve event and lift system. Think of it as like VTEC, it boosts power at both low and high RPMS, but unlike VTEC, there's no noticeable step or kick in the power delivery, which runs seamlessly from around 1,900 RPM to the 7,500 RPM redline. Unlike most other vehicles, this new 370Z is actually smaller than the car it replaces. Overall it's 2.7 inches shorter in length, but more importantly the wheelbase is a tenth of an inch shy of being four inches shorter, the rear track is wider by 2.2 inches and the overall height is now 0.3 inches shorter. Torsional rigidity at the subframes is also increased 30 percent at the front and 22 percent at the rear. Double wishbone front suspension replaces the multilink setup on the 350Z reduces weight through the extensive use of aluminum, both forged and otherwise, while the four-link rear suspension is also lighter and stiffer than the setup it replaces. The car you see here is equipped with the optional $3,000 "Sport" package, which brings that SyncroRev Match, 19" forged aluminum wheels with summer performance tires, a limited-slip differential and front and rear spoilers. That's an exhaustive and incomplete list of the upgrades but, importantly, it results not only in a car that's not terribly more expensive than the model it replaces (you can still get a Z for under thirty grand) yet drives much, much better. Where the old 350Z was pretty agricultural, with a harsh ride, boomy exhaust note and noisy interior, the new 370Z retains that essential character but moves it way over into the realm of acceptability. You could commute every day in the 370, take it on road trips or drive your mother-in-law around in it without her complaining. But to do so would miss the point because the 370Z was built to drive fast. Even with the stability control on and while wearing Bridgestone RE050s, the Z will spin up the rear tires in first, second and third gear during a street launch, going on to reach 60mph in 4.7 seconds. That addictive power is always available, in any gear, by planting your right foot. We say addictive because you're going to have a hard time not using it at every opportunity. Driving the Z in traffic we found ourselves behaving like assholes, taking opportunities to undertake a single car just for the chance to accelerate. Never before has the humble modern V6 sounded more purebred than this one. Any fears that the powerful, relatively light, rear-wheel drive Z would be an oversteering handful like the previous car aren't borne out driving this car on the road. Understeer is nearly complete in its absence, yet inadvertent tail out action is too. Sure you can still stomp on the throttle, but you're not going to be aggressively countersteering on ever corner exit. There's virtually no body roll. Steering is sharp, if a bit heavy, but feel is good - another improvement - so that weight isn't a problem. We do wish the wheel telescoped in addition to moving up and down. By now you're probably catching on to the fact that we really, really like the 370Z. But we have a reason for doing so. In an age of X6 Ms, GT-Rs and most other performance cars using technology to replace the need for a skilled driver, the Z still asks that its driver knows what he or she is doing, it's just ready to help them do it. That's the kind of progress these purists can live with.